This group has become a favorite among some of us here at Lightning's Girl. The logo is fairly easy to read so this isn't exactly the usual concept of guess who the band is but this logo is the ultimate all encompassing perfect stamp of evil. It is the one stop shopping of devil worshipping symbols. Animal heads, multiple 6s, upside down crosses, devil tails, pointy sharp looking spikes, bat wings, a pentagram, a flame, a pitchfork and webbing. I mean really what doesn't this logo have? And if their emblem isnt' enough for you, the band is decent too. 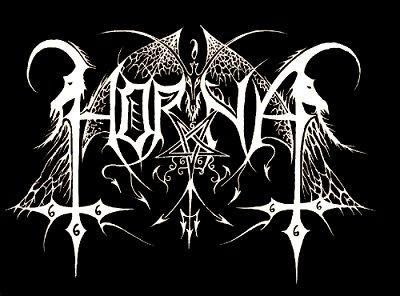 Horna - black metal from Finland.